A team from the Georgia Institute of Technology has received an award for $3.7 million from the National Science Foundation to help cover the cost of a new high performance computing (HPC) resource for the upcoming Coda building’s data center. The new HPC system, valued at $5.3 million, will support data-driven research in astrophysics, computational biology, health sciences, computational chemistry, materials and manufacturing, and numerous other projects. It will also be used for research that improves the energy efficiency and performance of the HPC systems themselves. 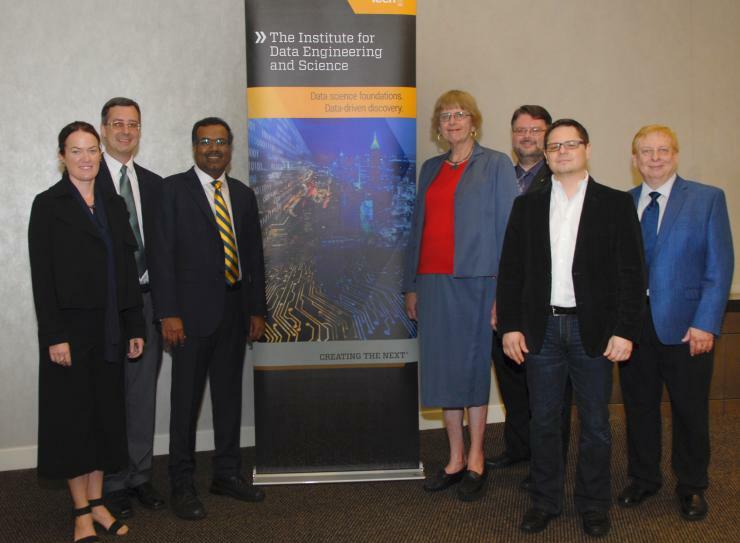 The effort was led by Srinivas Aluru, co-executive director of the Institute for Data Engineering and Science (IDEaS) and professor in the School of Computational Science and Engineering. Also central to the award are Surya Kalidindi, professor in the George W. Woodruff School of Mechanical Engineering; Charles David Sherrill, professor in the School of Chemistry and Biochemistry; Deirdre Shoemaker, professor in the School of Physics, Rich Vuduc, associate professor in the School of Computational Science and Engineering, and Marilyn Wolf, professor in the School of Electrical and Computer Engineering and the Rhesa "Ray" S. Farmer, Jr. Distinguished Chair in Embedded Computing Systems. The system is anticipated to begin operations in 2019, and will surpass the current campus capabilities. It will be used for applications that require large memories or local storage, provide modern GPU accelerators, and large storage capacity for data and simulation results. HPC simulations—one of several uses of the new system—are important for solving large-scale problems in hours or days, rather than months or years. Applications of these include detection of gravitational waves, climate models, performance of materials used in manufacturing or healthcare, and drug discovery. The new HPC acquisition will coincide with the unveiling of an 80,000 sq.ft. data center in the new Coda building. Coda, the 21-story, 650,000 sq.ft. new addition to Technology Square, lies adjacent to the Georgia Tech campus and major fiber pathways connecting the Southeast. “We worked to ensure the acquisition is well-timed to be the pivotal supercomputer in the Coda data center,” said Aluru. “This award is a major boon for interdisciplinary research at Georgia Tech, one that will also be a valuable addition to the HPC-based research community nationally. With Coda opening its doors soon, this supercomputer will become the premier computing resource at Georgia Tech,” said Executive Vice President for Reseach Chaouki Abdallah. IDEaS and many users of the new equipment will be based in Coda. System management will be handled by the Partnership for an Advanced Computing Environment, or PACE, also residing in Coda. Research enabled by new system will aid several national initiatives in big data, including strategic computing, materials genome, manufacturing partnerships, NSF-supported observatories such as the LIGO gravitational wave observatory, and the South Pole neutrino observatory known as IceCube. Researchers from all levels—from early career to undergraduate students—will be the target of training and outreach. Several Georgia Tech researchers and partner institutions will be awarded time on the equipment based on scientific merit and on the national significance of proposed problems. One-fifth of the system capacity will be dedicated to the research activities of regional partners including minority serving institutions. Other users can participate through XSEDE, a national network of NSF supercomputers that scientists use to interactively share computing resources, data and expertise.